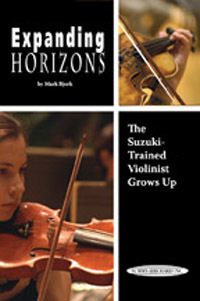 In this long-awaited publication, Professor Mark Bjork draws upon his distinguished 40+-year career with the Suzuki Method to offer insights into the unique strengths and needs of the Suzuki-trained student. Directed towards parents and advanced students as well as teachers, this book discusses not only technical development (scales, etudes, and exercises) but also the process of working independently and the preparation for life beyond Book 8 (including orchestra, chamber music, competitions and college auditions). As a special bonus, an annotated list of repertoire explores in depth, the spectrum well beyond that of the beginner, culled from the experience of a teacher who has successfully taught students from the age of 2 1/2 years to the university graduate level.